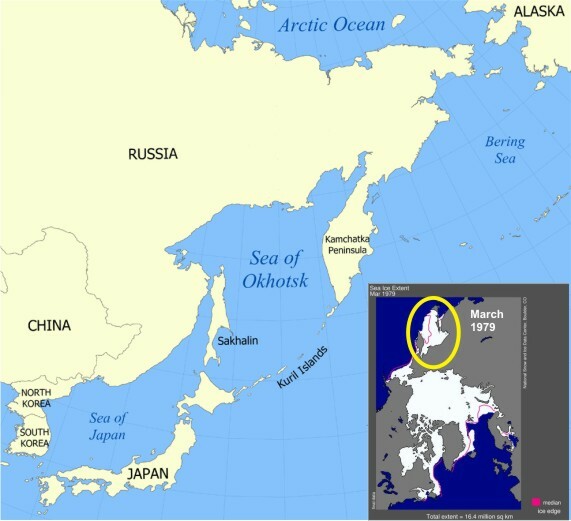 The Sea of Okhotsk covers 1.58 million kilometres squared (mkm2) – it’s a huge basin that was virtually filled with ice in March 1979 but only about 1/3 filled in 2015. 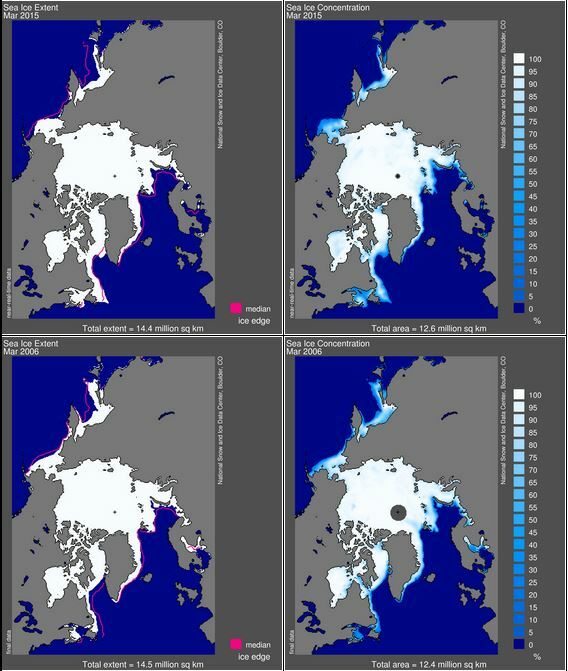 Detailed figures of ice cover, provided by NSIDC’s MASIE analysis since 2006, shows the ice extent for the Sea of Okhotsk in March 2006 was only 0.59 mkm21 — a large decline from its maximum extent in 1979. However, Fig. 3 (below) shows that there was even less ice in the Sea of Okhotsk in 2015 than there was in 2006. I estimate that in 2015, there was approximately 0.5 mkm2 of sea ice in the Sea of Okhotsk and northern Sea of Japan combined (precise MASIE data is not available for 2015, but looks most like MASIE maps for 20091). Figure 3. 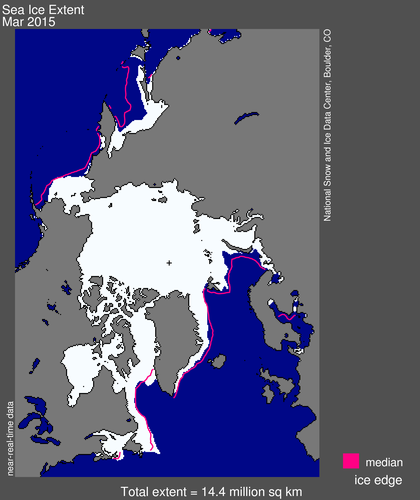 Arctic sea ice extent and concentration for 2015 and 2006 compared, courtesy NSIDC. Note that there was less ice in the Sea of Okhotsk in 2015 than in 2006, where MASIE archives show ice covered 0.59 mkm2. Click to enlarge. 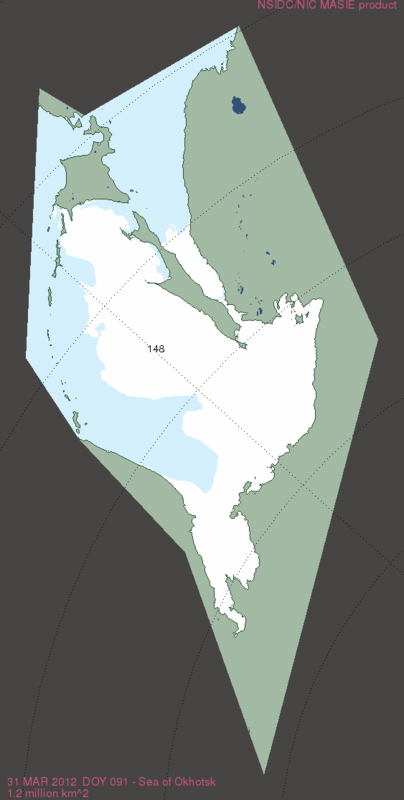 total extent 2015 (period low), 14.4 mkm2. The difference between them is 2.1 mkm2, of which approximately 1.1 mkm2 represents the change in ice cover in the Sea of Okhotsk and Sea of Japan between 1979 and 2015 (Fig. 4). Figure 4. 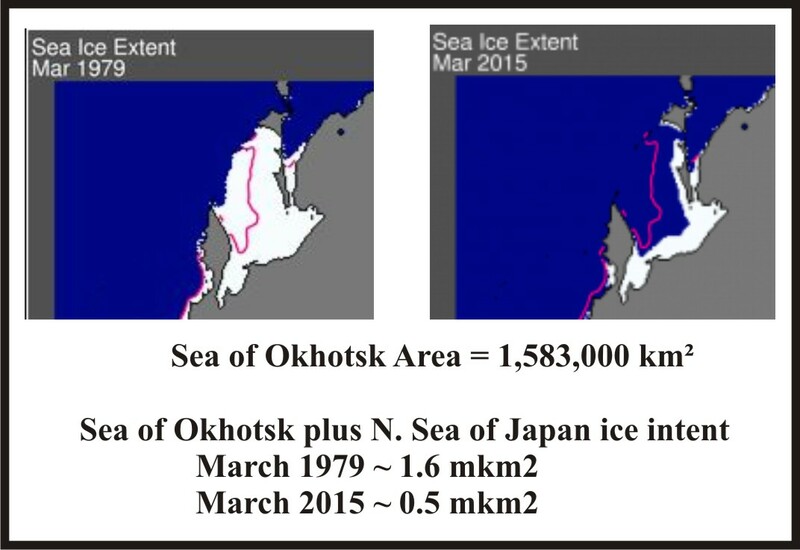 Comparing sea ice extent over the Sea of Okhotsk and northern Sea of Japan for 1979 and 2015 (extents approximate). Since polar bears do not live in the Sea of Okhotsk, it would therefore be totally disingenuous for a polar bear researcher, journalist, or conservation organization to state or imply that the “record low” maximum ice extent this year has any relevance for polar bear health or survival. But activist organization Polar Bears International recently did just that and so did polar bear biologist Andrew Derocher. Did they just not think — or were they deliberately misleading the public? 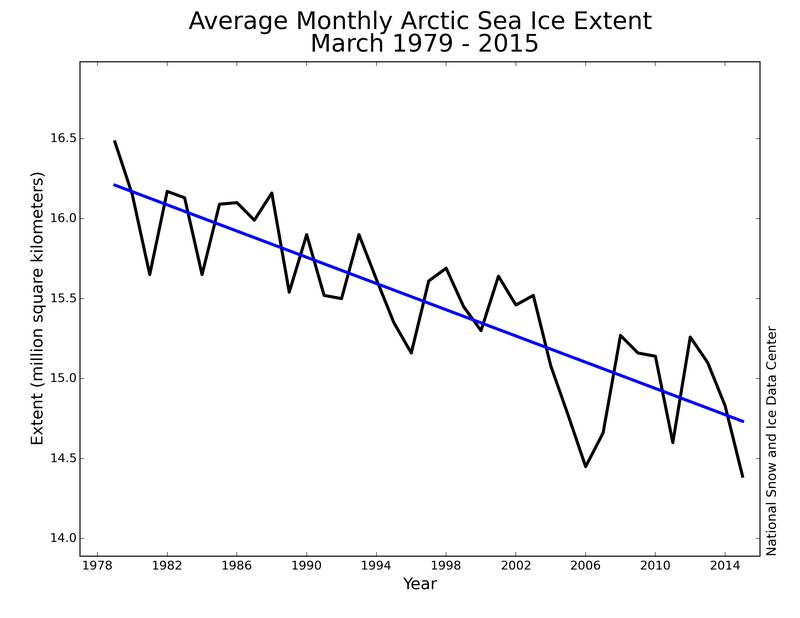 Arctic sea ice extent total for March > (≠) global polar bear habitat. In fact, I suggest that if ice extent figures for the Sea of Okhotsk, Sea of Japan and the Baltic Sea were removed from “Arctic” ice extent totals for the satellite record, we would find that total polar bear habitat at the end of March since 1979 has been about 15.0 mkm2 with relatively little variation over time. And as I explained in my last post, polar bear habitat this spring is abundant. Footnote 1: Sea ice extent totals at the end of March for Sea of Okhotsk (from NSIDC MASIE analysis archives) since 2006, the first available date, are given below. It is not clear if the extent totals given include ice in the northern Sea of Japan but they might. This entry was posted in Conservation Status, Sea ice habitat and tagged Arctic, declining sea ice, Derocher, habitat, lost ice, lowest maximum extent, March, misinformation, NSIDC, polar bear, record low, sea ice, sea ice extent, sea ice maximum, Sea of Okhotsk, spring, variation. Bookmark the permalink.